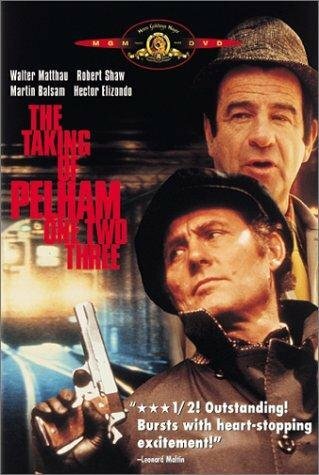 My wife says there's a movie on TV that's just starting -- The taking of Pelham 123 . I ask her if it's the real one or the remake, and she says it's the remake, so I say I'll give it a miss. I'm not sure why I have such a strong aversion to films that are remakes. Perhaps it's the lack of imagination that gets filmmakers to do remakes of films that were either quite good, and didn't need remaking, like The flight of the Phoenix , or else were rather mediocre, and the remake was no improvement, like The Poiseidon adventure . The taking of Pelham 123 was one of the former. If they showed the original on TV, I'd like to watch it. It they showed the original on one evening and the remake on the following, I might watch both for purposes of comparison, but if they show the remake on its own, I'm not interested. I can understand a remake if there have been technical advances that make a difference -- such as a remake with sound of a previously silent movie, or a colour version of a previously black and white one (one of that category that I did watch was Titanic , though it wasn't, in my view, an improvement on A night to remember ). But remaking The taking of Pelham 123 seemed entirely unnecessary on all counts. But perhaps I'm just funny that way, and getting old and curmudgeonly. I didn't watch the original Ocean's 11 because it had Frank Sinatra in it. And I didn't see the remake because it didn't. One remake I felt stood up was the Manchurian Candidate, mainly due to the strong cast and good direction. One remake which massively surpassed the original was Battlestar Galactica which really did turn a sow's ear into a silk purse!